What motivates an individual to work? Is it their peers, their family, or superiors? 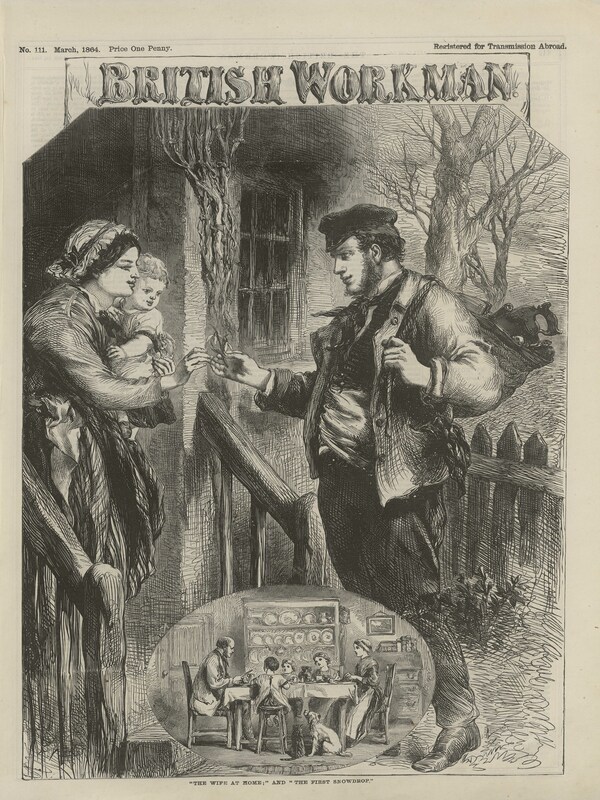 The Victorian penny monthlies, the British Workman and British Workwoman, illustrate how the media utilises identity to motivate a workforce. Although the British Workman wasn’t addressed to any particular trade or profession, a trade specific press grew enormously in the nineteenth century, covering everything from the Draper, the Accountant, to the Brewers Guardian. The generalising title of the ‘Workman’ does however create a group that the periodical targets as its audience. This creation of a group working identity is key to how it motivates a workforce ‑ and it is still evident in the way work is discussed in the twenty-first-century press. The language the British Workman uses to address its readership is key. The repeated use of the singular ‘worker’, ‘workman’ and similar terms that link hard work and integrity illustrate that there is pattern in the way the articles motivate the reader. Focusing on praising individuals, some fictional and some not, creates a model of the exemplary worker. Such depictions emphasise the implications of an individual’s work on his family and on community, which is utilised as a key motivation. “The picture which it places before the mind, is one of the grossest moral degradation; the drunken husband returning home to inflict increasing suffering on his unhappy family”. The emotive language and the praising of individuals that have overcome adversity emphasise the moral duty to work hard to support your family. Through stressing the community role of the individual this motivates the workforce as a whole. The British Workman creates a moral obligation for the individual worker to their family and their fellow workers. 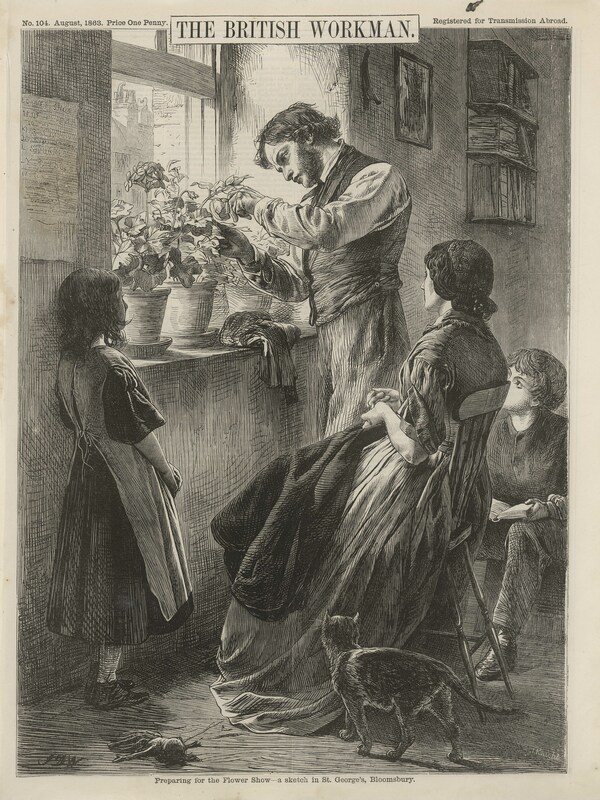 The British Workwoman is another nineteenth-century periodical with a focus on the obligation of work for the family. Work is discussed in terms of spheres of work in both the press that addresses the Workman and the Workwoman. The British Workwoman’s subtitle ‘Out and at Home’ is illustrative of the language of work that the periodical utilises, in terms of centralising the motivations of work through addressing the relationship between family and the world of work. The moralising sentiment of the majority of the content is underpinned by a focus on work as a means to support the household. This is used to encourage values that prioritise work and to encourage commitment to work, through inspiring stories of individuals’ perseverance and how others overcome difficulties. It may be assumed that the British Workwoman only includes motivations of work to maintain the household. However, it also addresses other matters such as the education of girls and women in professions deemed appropriate such as teaching and domestic service. Interestingly, the British Workwoman also details stories of men and disseminates ideas about the husband’s responsibilities for the family: work is deemed a family concern, not just one person’s labour. In the story of John Erskine, for example, at the prospect of losing his job there are repeated references to how this will impact his family and how his concern for his wife and children anchor him in place. This example utilises the family as a motivation to persevere in work despite obstacles. It is also a great example of the common trope of the fiction in the British Workwoman and British Workman that entails a moralising ending where the individuals that abide to Christian values and moral practices at work are rewarded with earthly goods. These stories that teach the reader of the rewards of upholding their moral standing at work also emphasise pride in work. They illustrate how central work is to our perception of ourselves and others: work, they say, is integral to the identity and reputation of the individual and the family. Perhaps surprisingly, the way work, and changes in the way we work, are discussed in the current press can also be moral in focus. This article for example on the ‘10 Ways Millennials Are Creating The Future Of Work’ is incredibly positive about the moral improvements that the millennial workforce will bring. It suggests that the emerging group of workers will improve the transparency and community role of companies as well as prioritising collaborative and meaningful work. These buzzwords illustrate that language that relates the effects of our work on defined groups is still key to the way work is discussed. Even if the focus has changed from the family to society in general, the idea remains the same. As in the Victorian period too, the current press that covers any matter relating to work can be characterised by the way it identifies groups of workers. These groups are primarily defined through generation ‑ very few articles about work can avoid mention of the ‘millennial’ or ‘baby boomer’. It is not as if generations are ever likely to work in isolation from each other, but defining experience as shared “horizontally” within a generation rather than inter-generationally creates a fragmented group working mentality – even perhaps a hostile one. This inevitably calls to mind the old idea of “divide and rule”. Is it thus that older ideas of a class politics based on what work one did rather than how old one was is being undermined? Are we being reduced to dispersed demographics who are, perhaps, less univocal and unified than the media suggest? The reality of the generational gap and our experiences of work is that yes the world of work is changing and continuing to do so; what skills and education are required are changing; technology is continuing to change the world of work. But since most us work in multi-generation workplaces and members of the same generation have a wide variety of experiences, the differences are not so extreme. The British Workwoman, “In Stony Places: A Story of the Work-A-Day World”, No.270, p.42.